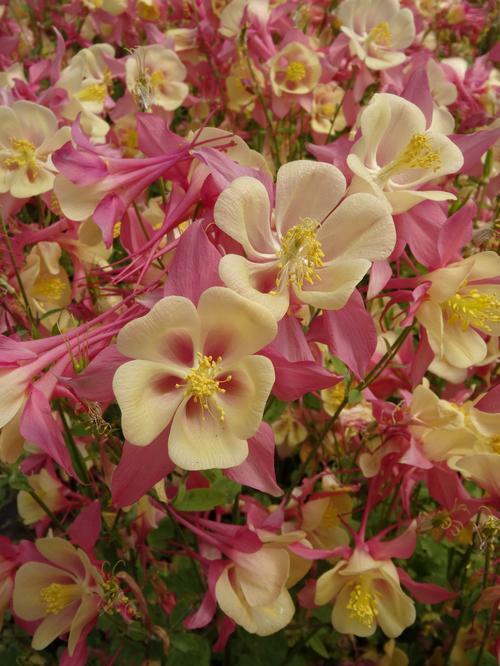 Short and more compact, strong sturdy stems with superior branching produce broad and more uniform canopies of rose-pink flowers, exceptional long bloom time. 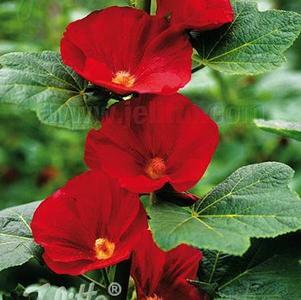 Short and compact with dark green foliage, better branching with shorter internodes forms a tighter and more uniform flower canopy, large velvety red flowers with yellow centers have an exceptional long bloom time. 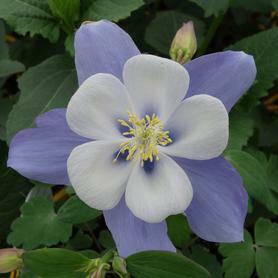 Unique bicolor flowers of pale blue and white hoods with intense deep blue lower petals, forms large clumps of glossy dark green deeply cut foliage, flowers bloom on tall wide-branching panicles. 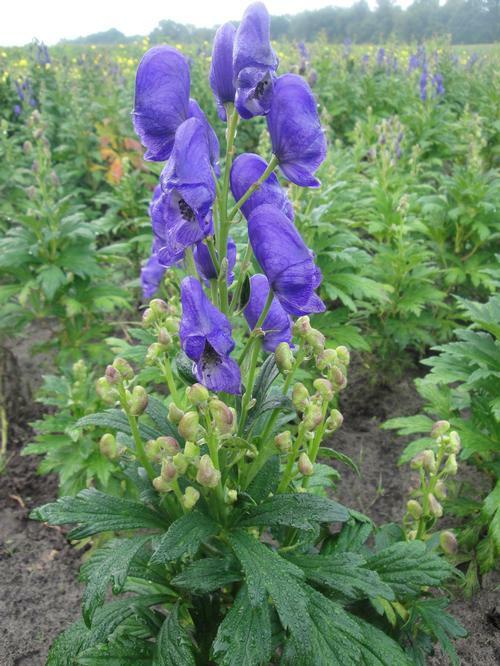 Vigorous plants with narrow dissected leaves, tall spikes of violet-blue flowers, excellent cut flower. 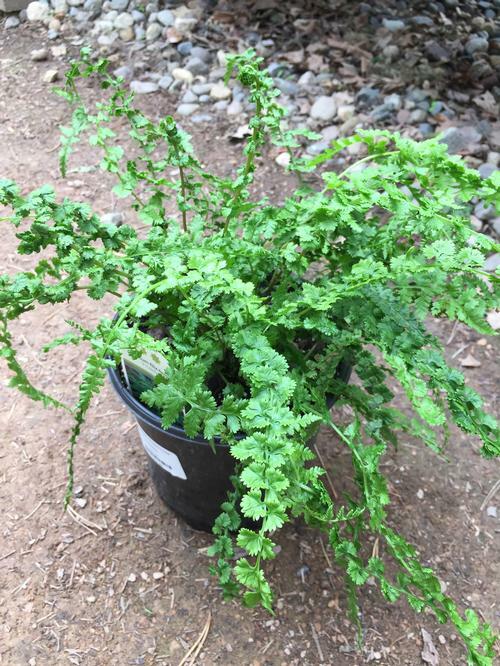 Rapid growing and spreading ground cover. 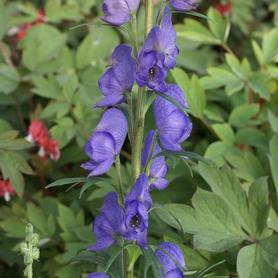 Grows where other plants may have difficulty growing. Tolerates full sun to full shade. 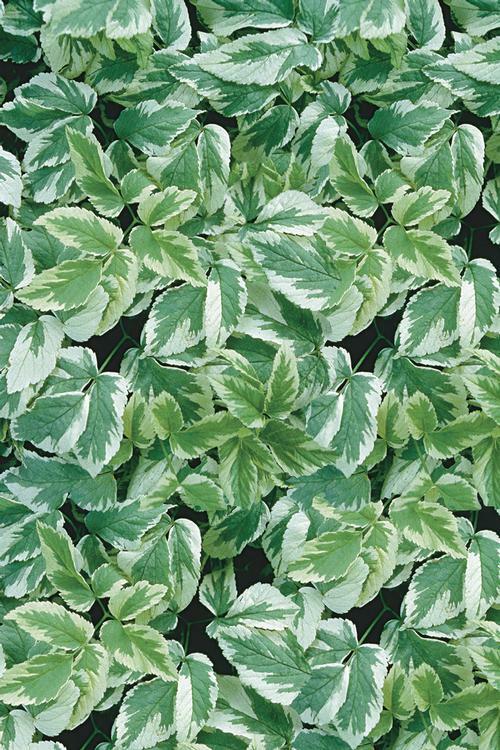 Green and white variegated foliage with white flowers. 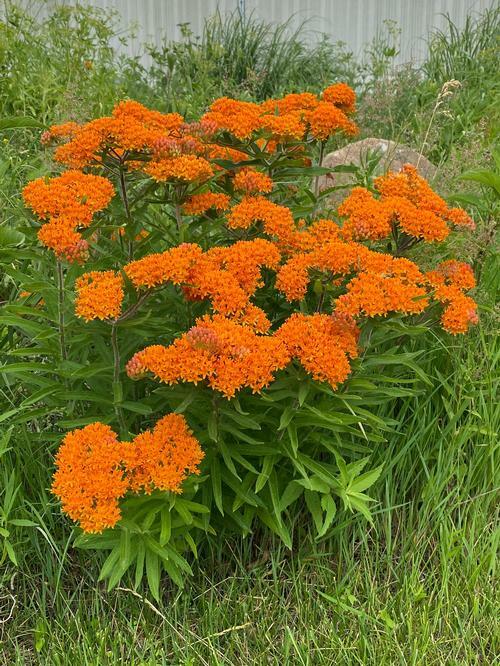 Short and very compact with gray-green foliage, excellent branching habit produces an abundance of fiery-orange flower spikes, blooms all summer. 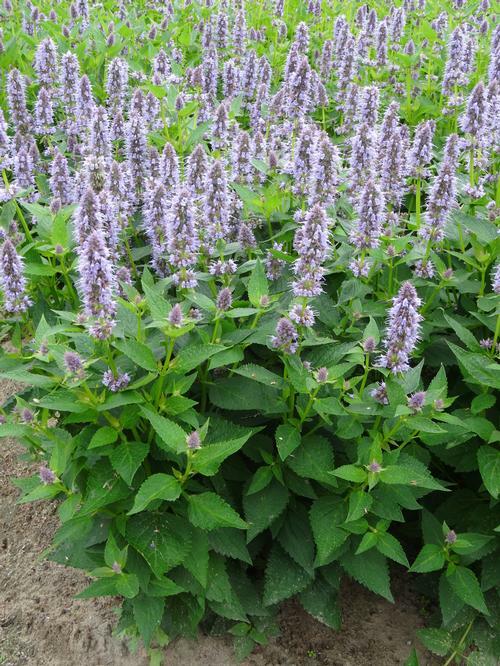 Little Adder is a more compact form of Black Adder and very dwarf when compared to others, tons of violet blooms will last most of the summer into fall, fragrant licorice-scented foliage is an added bonus. 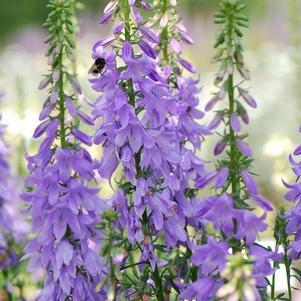 Wonderful fragrant licorice-scented foliage, exceptional long bloom time, violet-blue flowers. 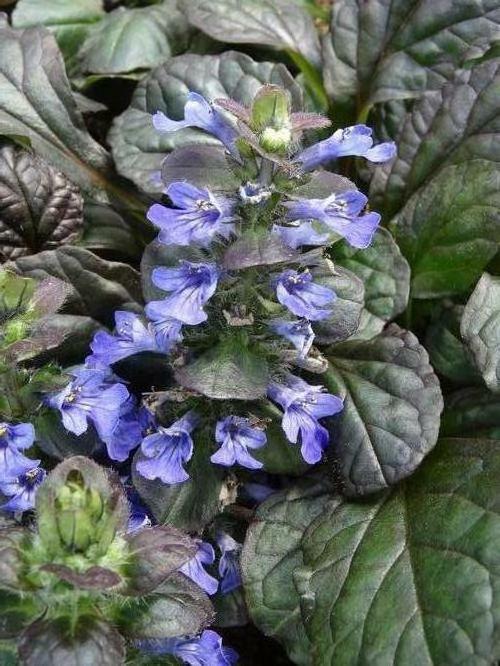 Very dark burgundy to almost black glossy foliage, dark violet-blue flowers bloom early spring, plants are resistant to powdery mildew and heat tolerant. 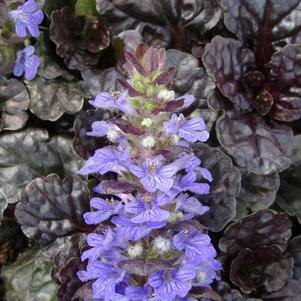 This reblooming Ajuga will have intense purple-blue flowers in early spring and then again in summer, foliage is variegated and the new shoots aare beautiful pink colored, low maintenance. 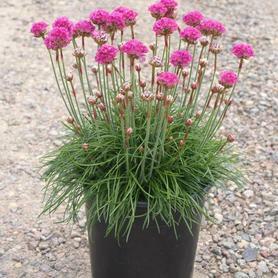 Large, 5″ single lavendar flowers with a pink halo. Well branched. 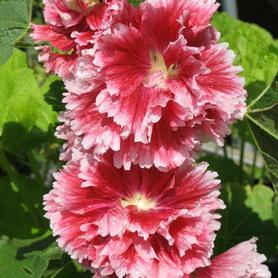 True perennial hollyhock which flowers the first year from seed, single red flowers bloom on tall stately stalks all summer, pinch to produce more compact and bushy plants. 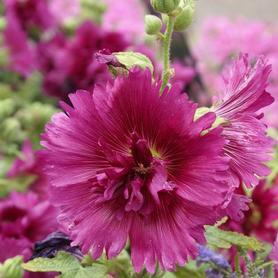 True perennial hollyhock which flowers the first year from seed, brilliant pink single flowers bloom on tall stately stalks all summer , pinch to produce more compact and bushy plants. 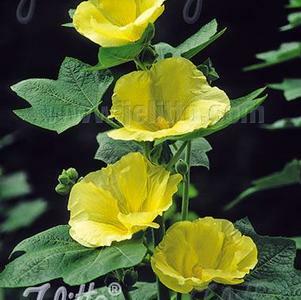 True perennial hollyhock which flowers the first year from seed, single yellow flowers bloom on tall stately stalks all summer, pinch to produce more compact and bushy plants. 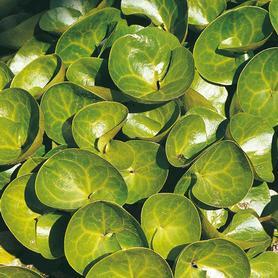 Round bright green leaves with clusters of tiny yellow-green flowers in late spring to early summer, very easy to grow. 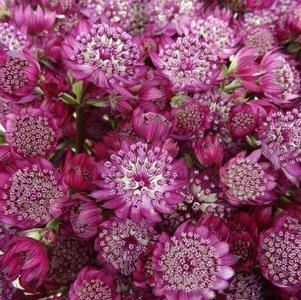 2" round shaped flowers of merlot-purple appear in summer on top of narrow green foliage. 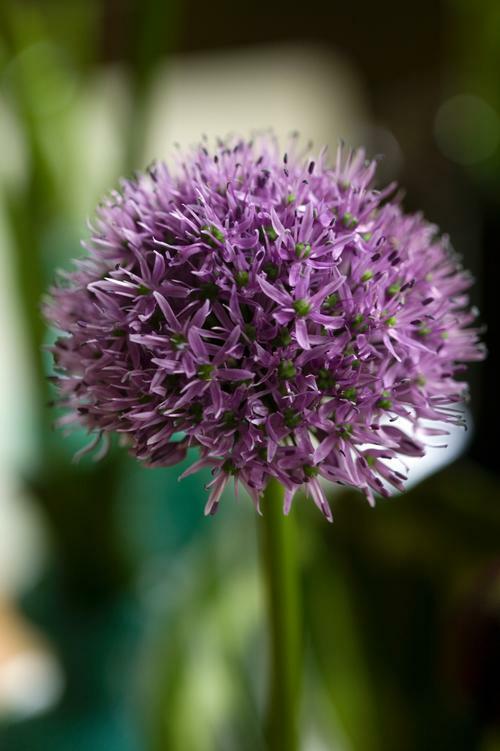 Alliums are great if you have trouble with animals eating your garden, these plants are "nibble proof" to most pests but loved by pollinators. 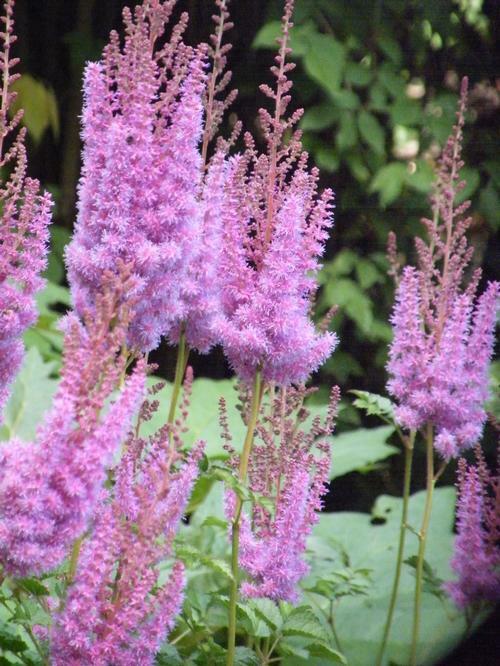 Gladiator is a stately in the garden with large 6" rose-purple flowers in summer on top of tall sturdy stems, bunny and deer resistant but loved by pollinators. 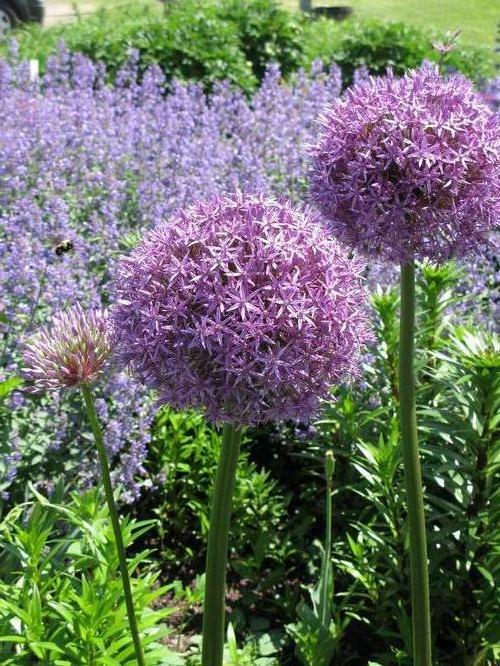 One of the biggest Allium flowers available, giant 8-10" purple, round blooms appear in early summer above lush green foliage and sturdy stems, bunny and deer resistant but loved by pollinators. 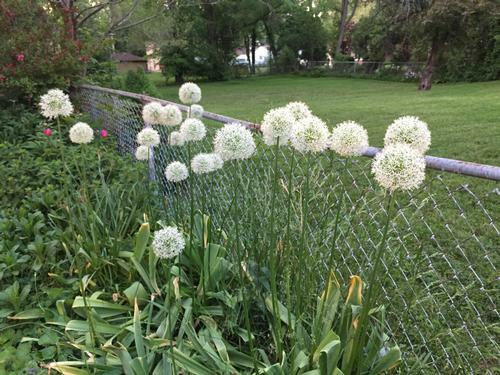 This fool proof variety of allium is clump forming and produces sterile seed that will not spread, purple-pink flowers appear in late summer and are held above green grass-like foliage, excellent deer and rabbit resistance. 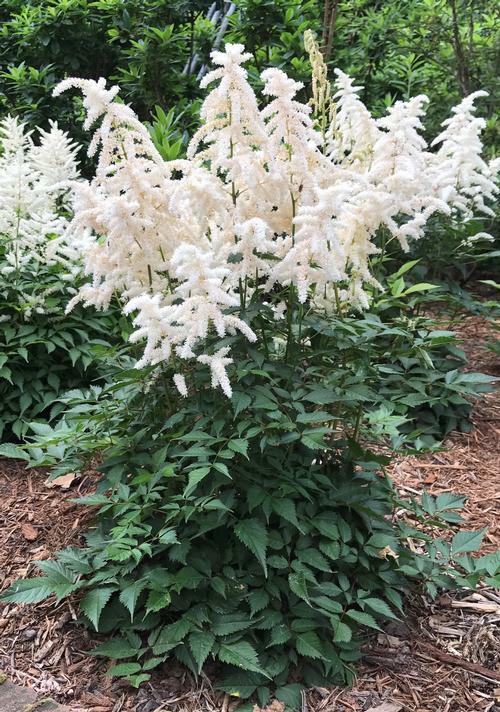 4" round shaped pure white flowers appear in summer above sturdy stems. 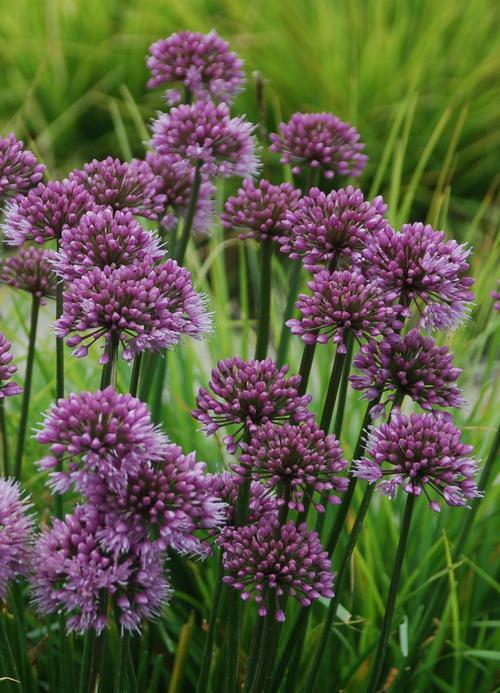 Alliums are great if you have trouble with animals eating your garden, these plants are "nibble proof" to most pests but loved by pollinators. 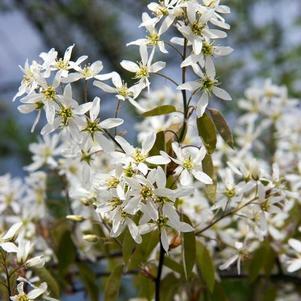 Serviceberry is rare in that it offers interst in every season. 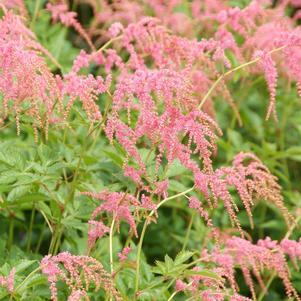 It kicks off in spring with beautiful white flowers, which develop into tasty purple berries that attract birds in ealry summer. 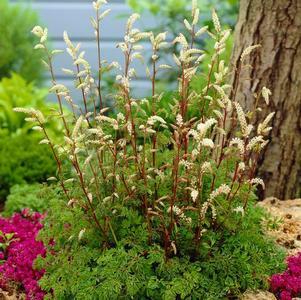 Leaves turn to a beautiful shade of red and orange in fall, and its silvery bark offers winter appeal. 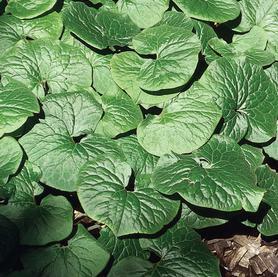 Native clump-forming perennial found along the woodlands edge or river banks. 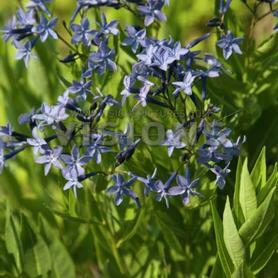 Spectacular spring bloom with clusters of 5-petaled star-shaped flowers. 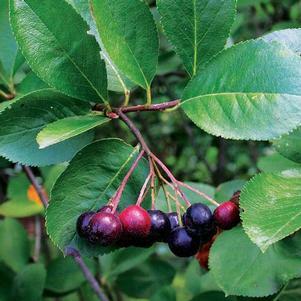 Grows from semi-woody rootstocks. 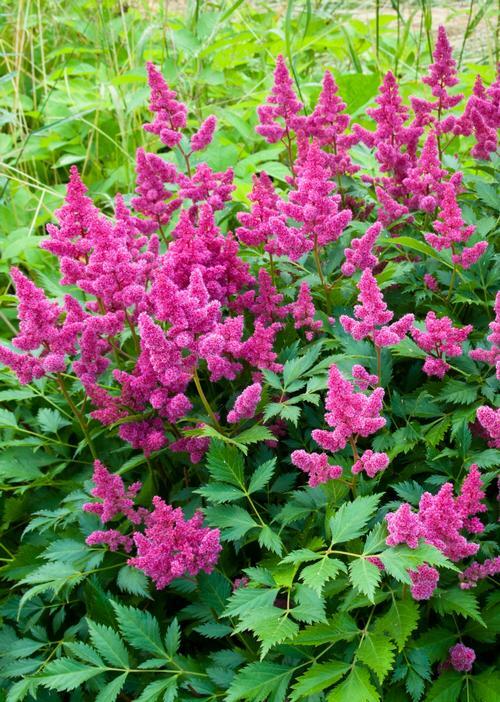 Prefers loamy well-drained soil. 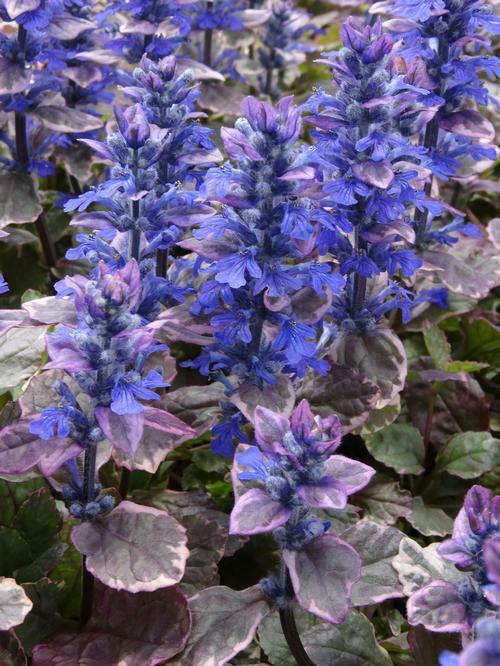 Compact selection with narrow dark green foliage, spectacular clusters of dark lavender-blue flowers bloom late spring, foliage turns bright yellow in fall for added color. 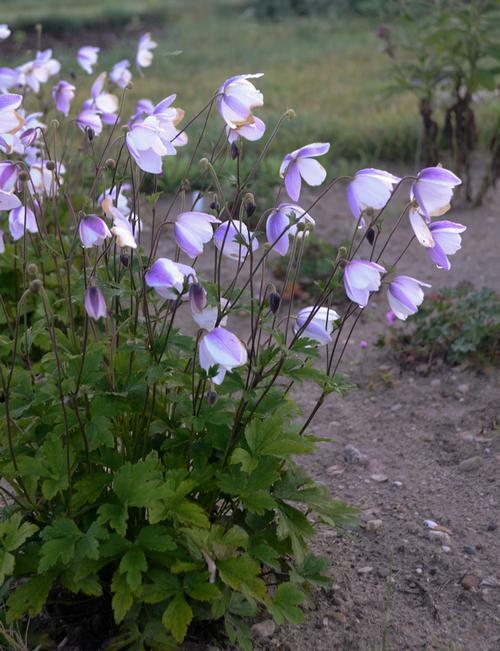 Flowers will appear earlier and longer than other varieties, the nodding buds will open to reveal two-toned flowers, petals are pure white on the front and violet-blue on the back, compact and will not re-seed. 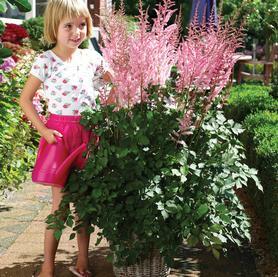 The large, single rose-pink flowers with golden yellow centers will bloom profusely from late summer to fall. 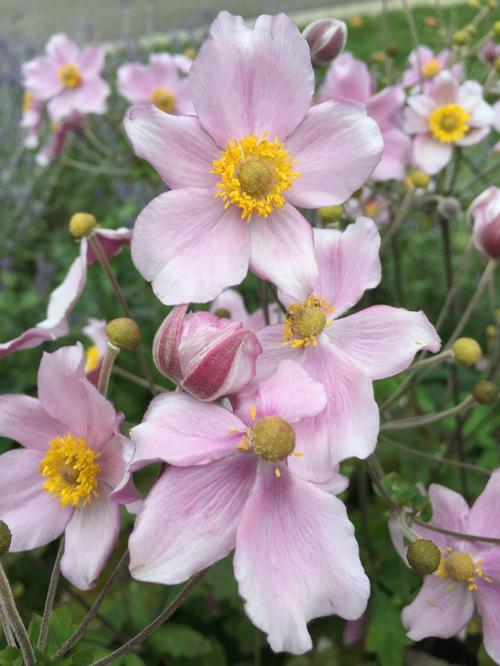 Most hardy and vigorous anemone, earliest to bloom, forms attractive clumps with single pink flowers. 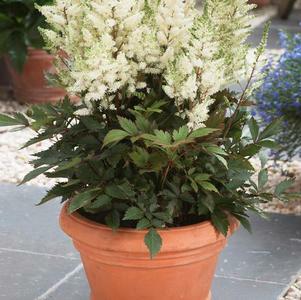 Very floriferous, large single white flowers on upright stems for 5 weeks or more in late summer. 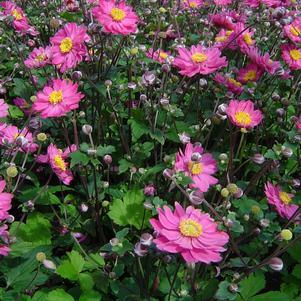 Very large semi-double to double pink-red flowers bloom late summer, a bit shorter than most Anemones, attractive dark green foliage. 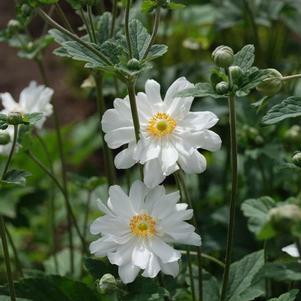 Very vigorous and floriferous variety, large 4" semi-double white flowers. 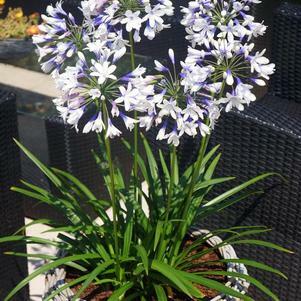 Large 3" light blue and white flowers with long attractive spurs, very showy and upward facing, long bloom time. 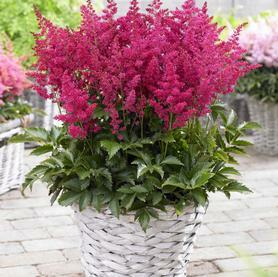 Large 3" red and white flowers with long attractive spurs, very showy and upward facing, long bloom time. 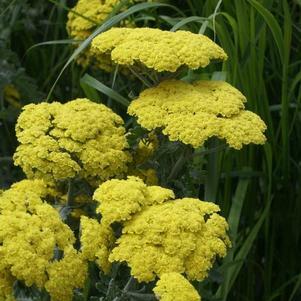 Wonderful bright yellow selection with large double flowers and long attractive spurs, very floriferous and bright spring color. 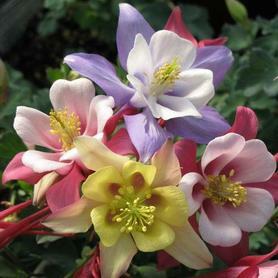 Soft pink petals with lemon yellow centers are a very pretty sight in spring, nectar rich blossoms are attractive to hummingbirds, vigorus grower with long bloom time. 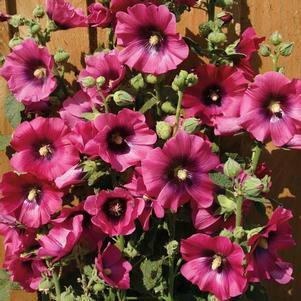 Large 2-3" upward facing flowers bloom on compact plants, exceptional color range and long bloom time. 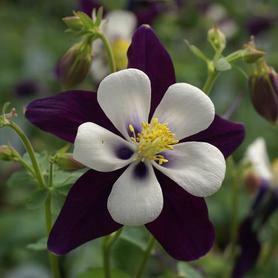 Absolutely huge bi-color flowers, rich violet-purple outer petals and long spurs boldly contrast the pure white inner petals, yellow stamens add additional color, Plant Select. 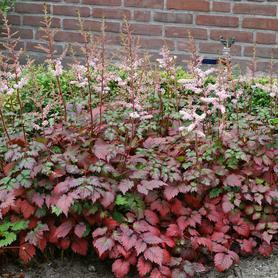 Upward facing red and white flowers with small red spurs, forms compact mounds of blue-green foliage. 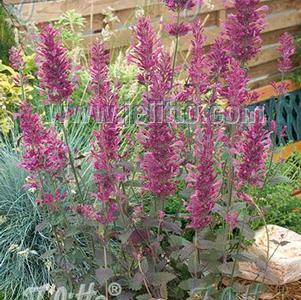 Fast growing herbaceous perennial grown for its lush tropical-like foliage. 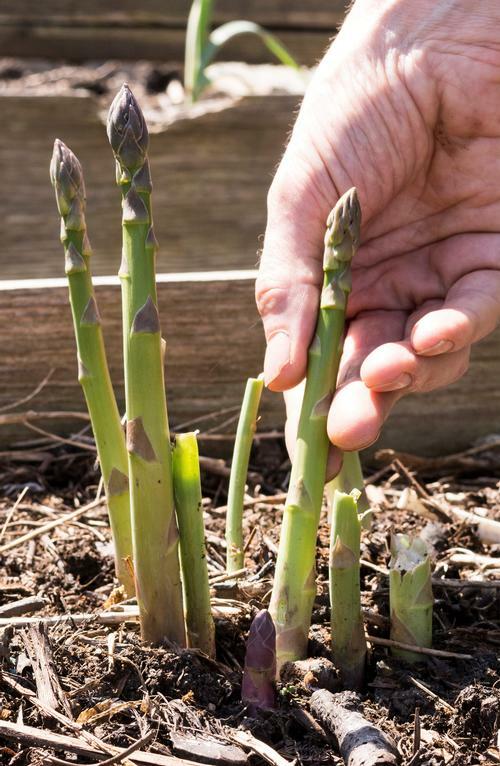 Early spring shoots are edible. 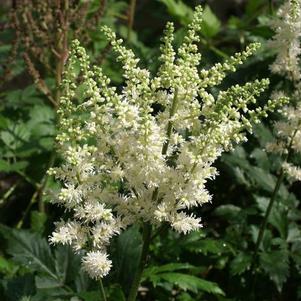 Large umbels of small white flowers bloom late summer. 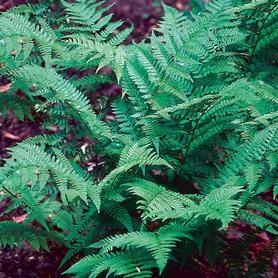 Tolerates a wide range of soils and grows best in partial shade. 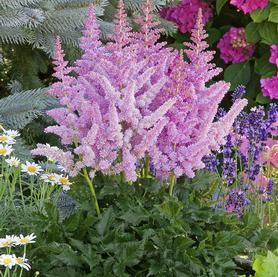 These perennials are grown mostly for their colorful, ornamental foliage. 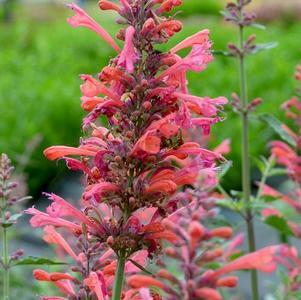 Most are very drought tolerant and prefer well-drained, more alkaline soils. 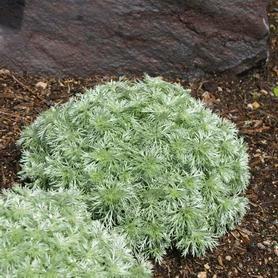 Most popular form and one of the best gray-colored perennials, soft silver-gray foliage forms rounded compact mounds, excellent for edging or in rock gardens. 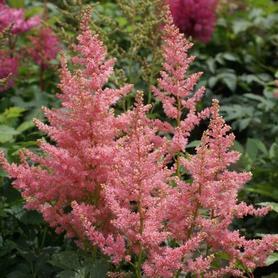 Plants and flowers resemble those of Astilbe. 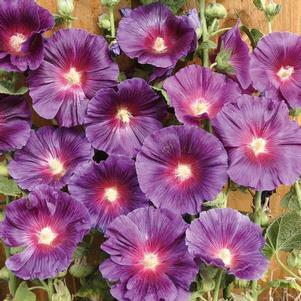 They prefer moist soil with partial to full shade. 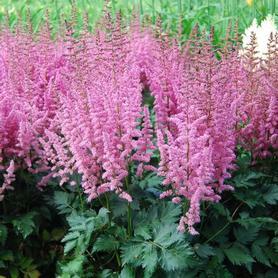 Tall, open plumes bloom early summer. 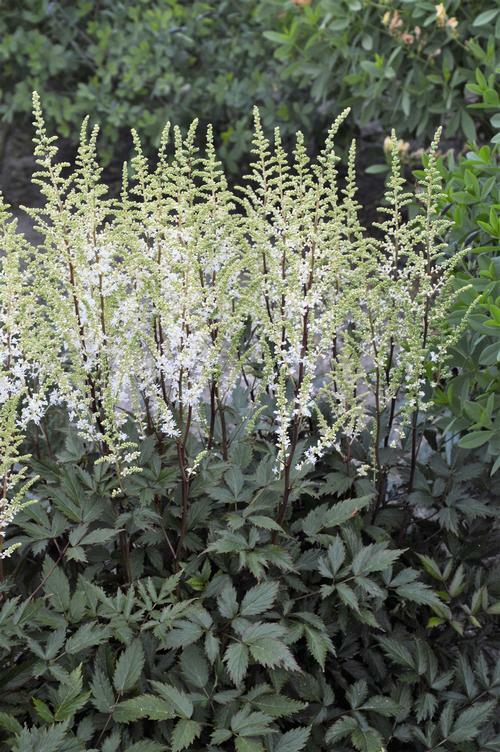 Forms dwarf compact clumps of dark green astilbe-like foliage, densely arranged creamy-white flowers bloom on upright panicles. 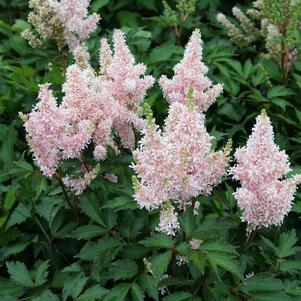 A giant astilbe-like plant, tall whispy plumes with cream-colored flowers bloom mid-summer, grows best in moist semi-shaded areas. 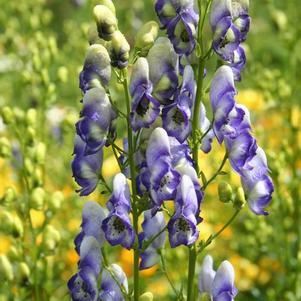 Wildflower that performs equally well in the shaded garden. 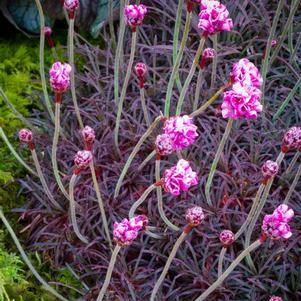 Grown for its foliage as the flowers are rather inconspicuous. 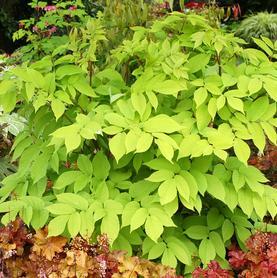 Large round green foliage, spreads thru underground rhizomes, greater heat tolerance than europeaum. 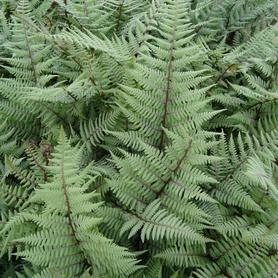 Large 4" glossy green foliage, slow spreader that will tolerate full shade, evergreen in milder climates, less hardy. 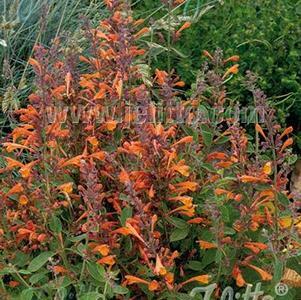 Prized perennial for attracting butterflies. 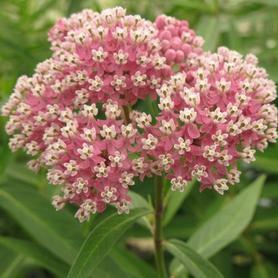 Flowers are long lasting and bloom early to mid-summer. 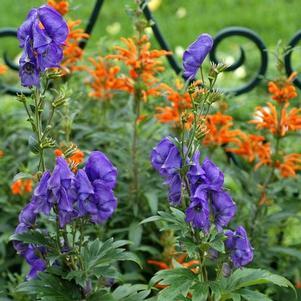 Plants do not like to be transplanted and should be allowed to "naturalize". 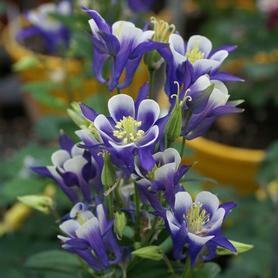 Similar in growth and size to Cinderella except with white fragrant flowers. 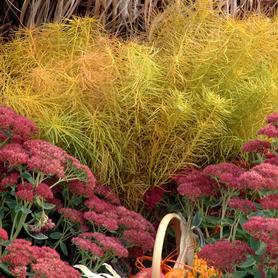 Late to break dormancy, prefers drier and well-drained soil, vibrant orange flowers are a magnet for butterflies, attractive seed pods are used in floral arrangements, grow above 65ºF and dry. 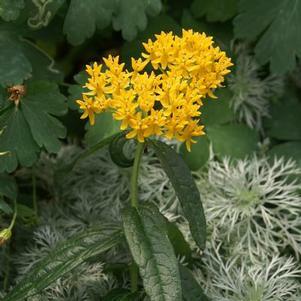 Hello Yellow has lots of golden yellow flowers in July and was hybridized from the native Asclepias tuberosa, the narrow green leaves are an important food source for Monarch caterpillars, drought tolerant and easy to grow. 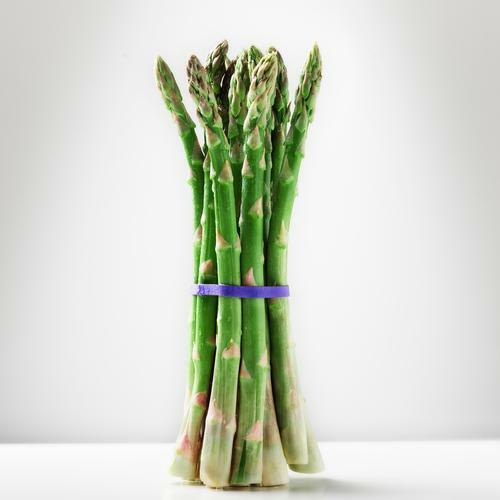 A springtime perennial vegetable, you should eat the spears when they first appear because they are most tender at that time. 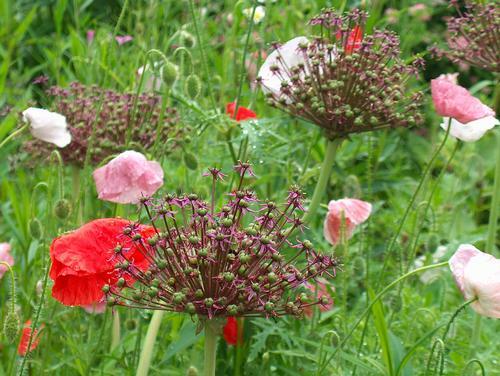 Wait to harvest any spears until the second year after the crowns have been planted. 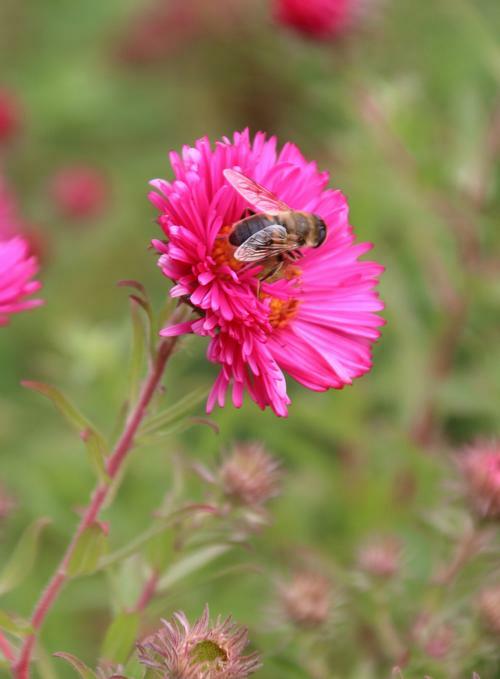 A springtime perennial vegetable that is a female type with smaller, more tender spears, most popular selection. 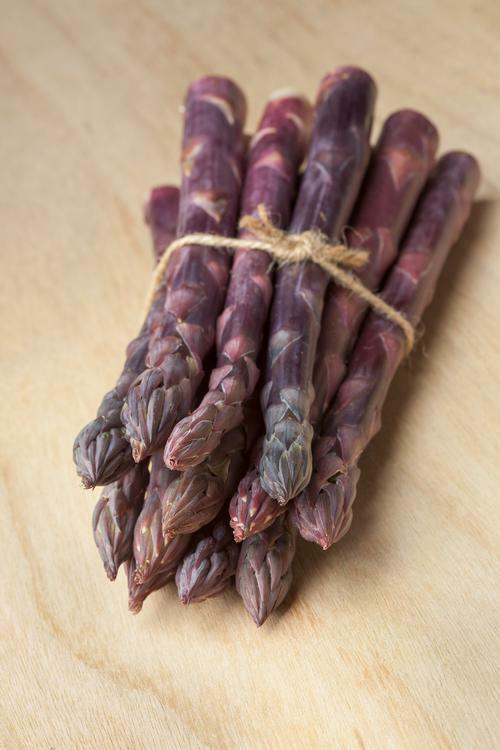 Produces attractive purple spears with a mild and sweet flavor, when cooked the spears will loose some of their purple color, most tender variety. 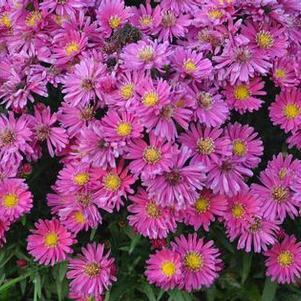 Vibrant magenta-red flowers with yellow centers will cover the foliage of this Aster for weeks in fall, tidy compact-clumping habit, this beauty adds lots of color to the late season garden. 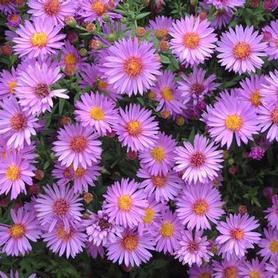 Lilac-blue flowers with yellow centers will cover the foliage of this Aster for weeks in fall, tidy compact-clumping habit, this beauty adds lots of color to the late season garden. 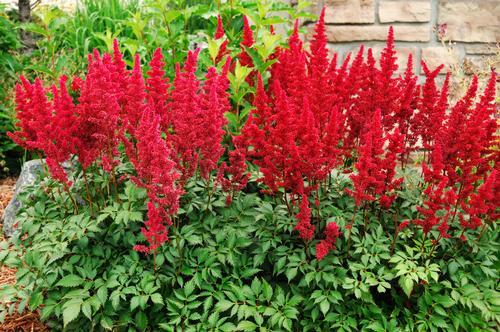 Forms compact mounds, densely pack red flowers with yellow centers bloom late summer, remains one of the best reds. 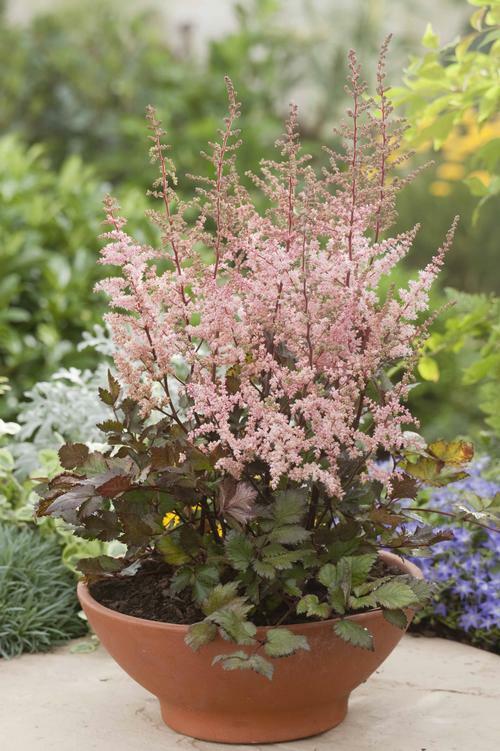 Attractive dark green rust resistant foliage, compact plants, clear pink flowers. 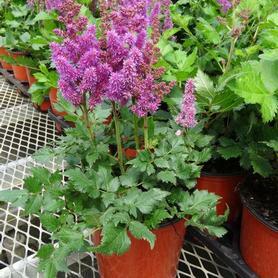 Attractive dark green rust resistant foliage, compact plants, purple flowers. 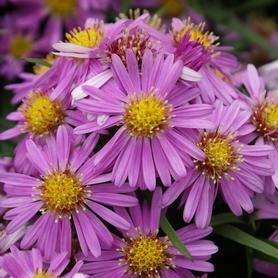 Best medium height aster, attractive foliage is very floriferous with deep purple flowers. 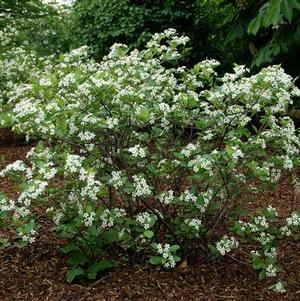 Mid, one of the best bloomers, large open plumes, pure white flowers. 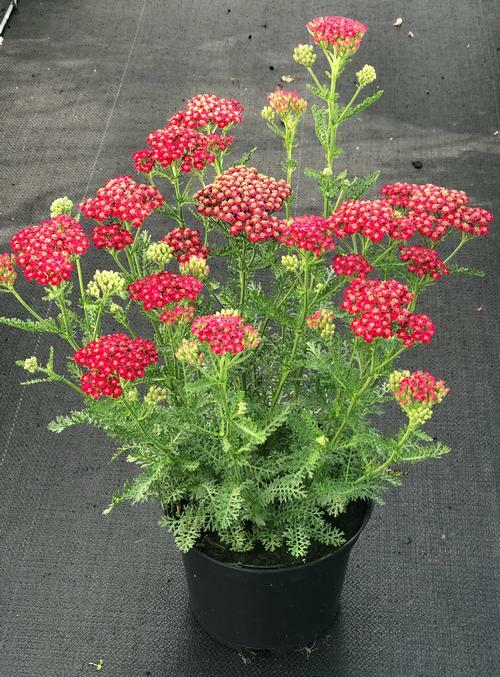 Mid, deep burgundy red flowers, thick reddish stems and deep red buds provide long lasting color, flowers are slightly fragrant and form triangular-shaped plumes, attractive glossy deep green foliage. 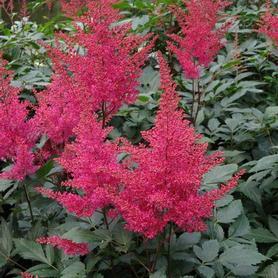 Early-mid, all-time favorite, attractive bronze foliage, full and narrow plumes, dark blood-red flowers. 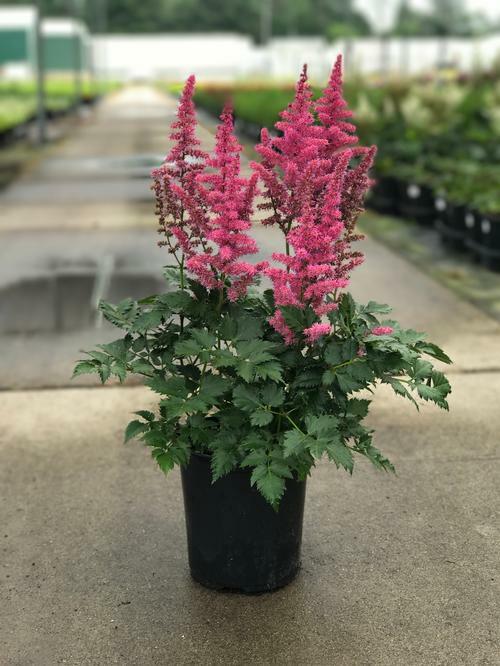 Early-Mid, compact plants with large plumes of soft bubble-gum pink flowers accented with gorgeous red stems, large full plumes, fragrant, vigorous grower. 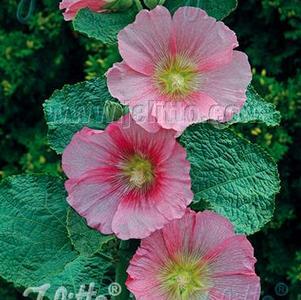 Early-mid, very full stocky plumes, profuse bloomer, excellent for pots, clear white. 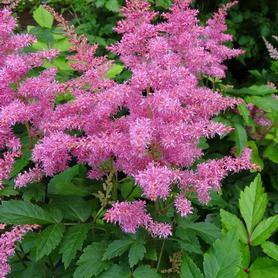 Dwarf form of Visions, compact dark green foliage, very floriferous with thick sturdy stems and upright raspberry-purple plumes, more sun tolerant. 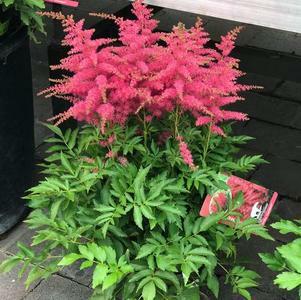 Late, this giant Astilbe has clusters of cherry red flowers on chocolate-red stems, held above large clumps of ferny dark red foliage that becomes more green after flowering. 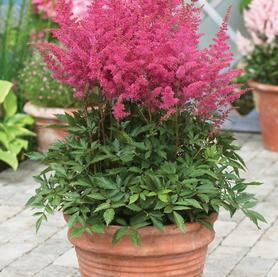 Late, tallest astilbe, robust grower forms huge clumps of large dark green foliage, towering stems up to 4 feet tall with huge plumes of bright pink flowers, 2009 Plantarium award winner. 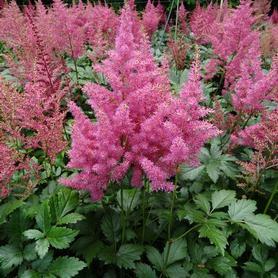 Late, another huge astilbe similar to Mighty Pip but with 4 foot towering red flower plumes, large foliage and robust grower. 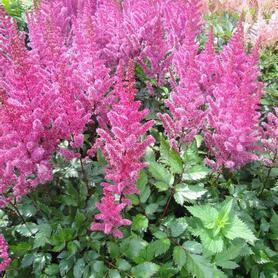 Late, most drought resistant astilbe, dwarf spreading plants with coarser foliage, suitable for use as a ground cover, pinkish-purple flowers. 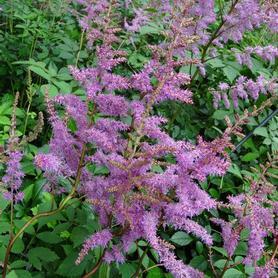 Late, large astilbe with dark foliage, very long and narrow upright purple-rose plumes. 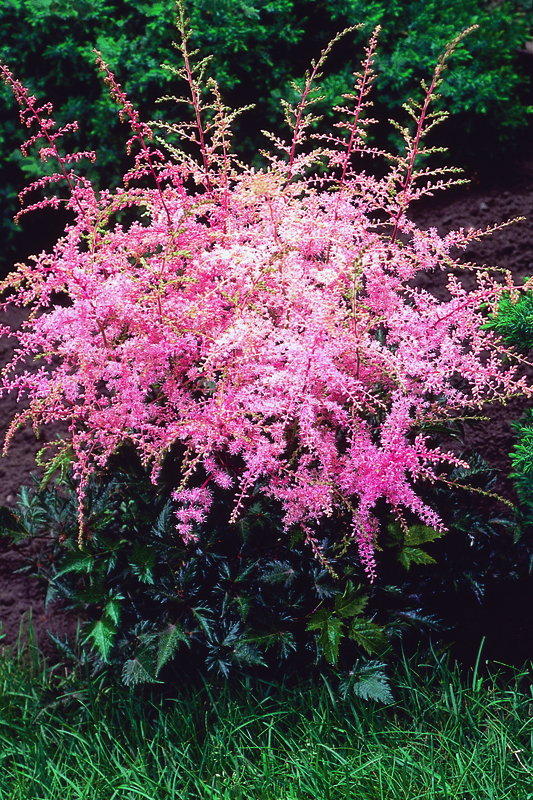 Early, light pink flower plumes stand out nicely against the glossy dark colored foliage, compact habit with strong stems. 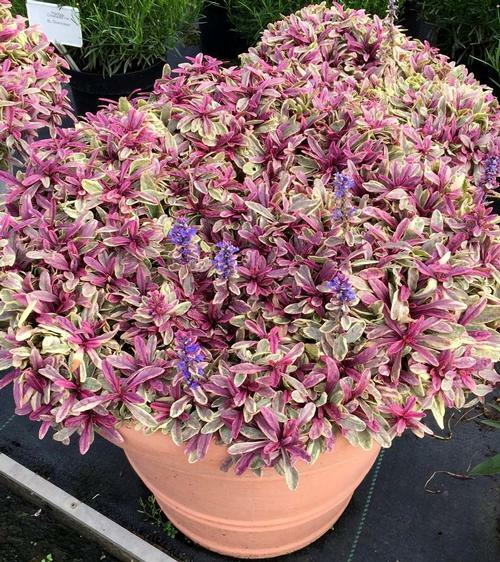 Mid-late, dark bronze-green foliage with thick red stems, red buds open to purple-red offering long-lasting color, good drought and sun tolerance. 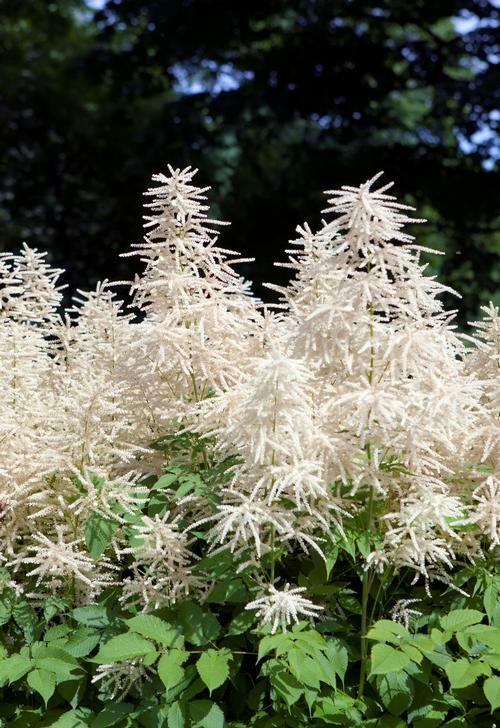 Mid-late, compact with thick strong stems, upright panicles bear pure white flowers, excellent substance and good drought tolerance. 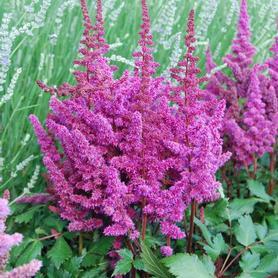 Mid-late, more drought resistant than other Astilbe, compact plants and upright narrow plumes are ideal for containers, fragrant raspberry-purple flowers. 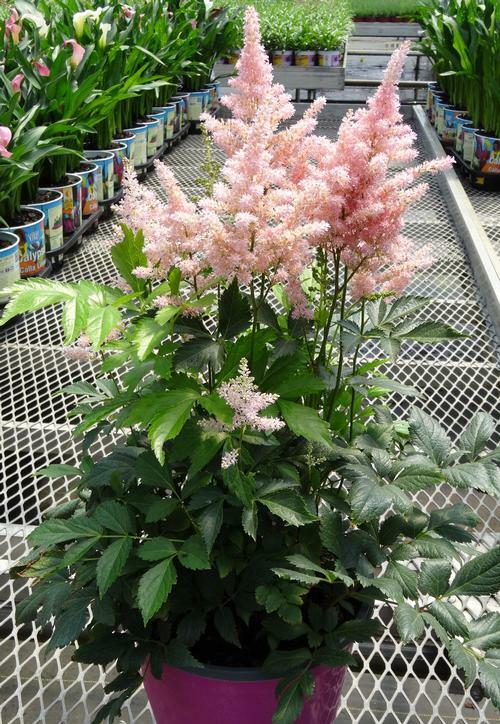 Late, the dark red stems of this Astilbe stand out against its pure white flowers that will mature to cream, blooms appear in late June to July over glossy, deep green foliage. 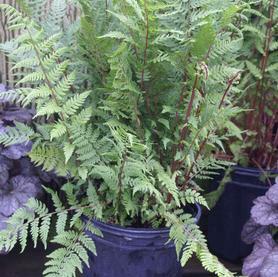 Early, dark green foliage, medium sized plants are good for pots, open plumes of creamy white flowers. 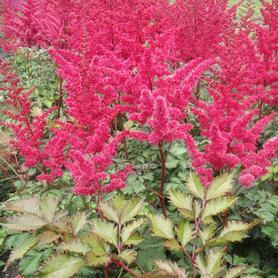 Mid, reddish bronze foliage, reddish stems with tall plumes of dark red flowers, one of the best reds. 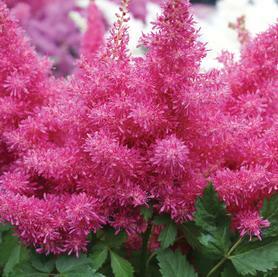 Early, most popular pink, vigorous plants and very floriferous, large full plumes, clear pink. 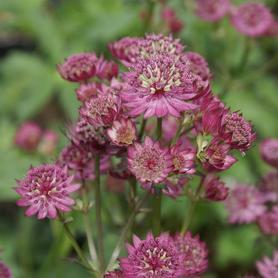 Late, short compact plants, attractive bronze-green very lacy foliage, delicate drooping plumes, shell pink flowers. 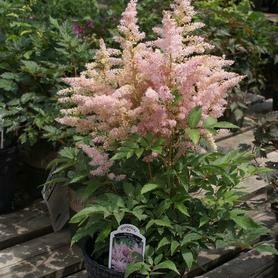 Late, unique blue-green foliage with a silver overlay, reddish stems add color and bear more open panicles of delicate peach-pink flowers, vigorous grower and more sun tolerant than others. 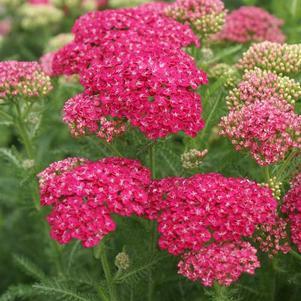 Mid, dark green foliage with sparkling bright pink flowers, a robust grower with larger flowers and big full plumes. 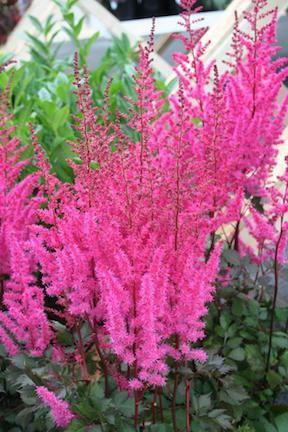 Early, very compact foliage with upright carmine red plumes, very floriferous, blooms early summer. 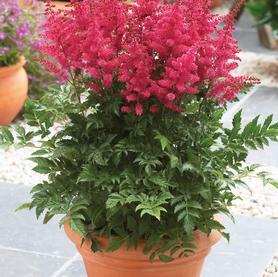 Early, very compact foliage with full upright cherry-red to hot pink plumes, very floriferous, blooms early summer. 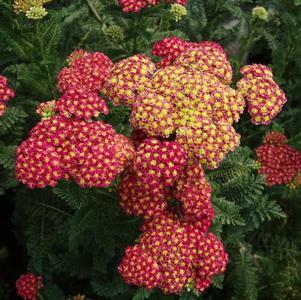 Early, very compact foliage with upright ruby-red plumes, very floriferous, blooms early summer. 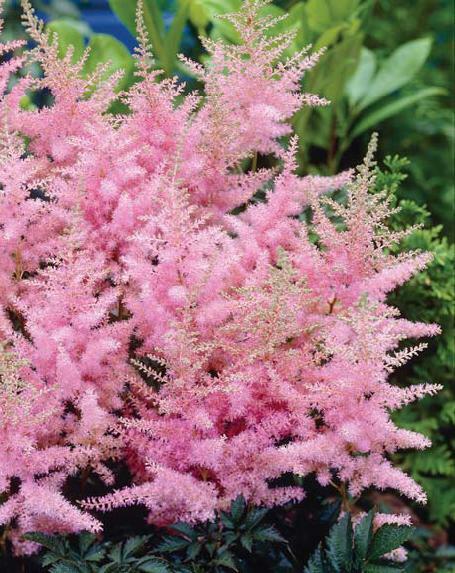 Early, very compact foliage with very thick silvery pink plumes, very floriferous, blooms early summer. 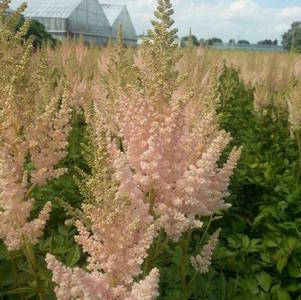 Early, very compact foliage with clear white plumes, blooms early summer. 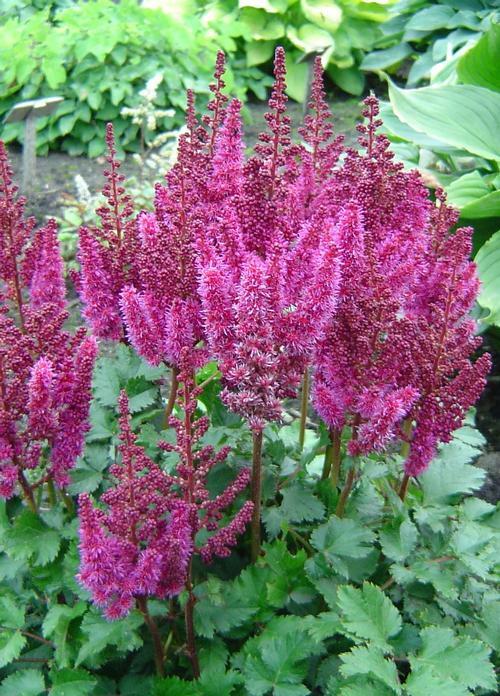 Tall purple stems with clusters of dark wine red flowers, outer bracts are very dark while centers are lighter, free-flowering. 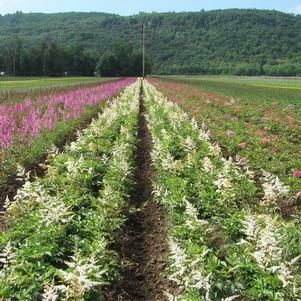 Starry carmine rose flowers with bright white centers, very floriferous with long-lasting flowers, vigorous grower. 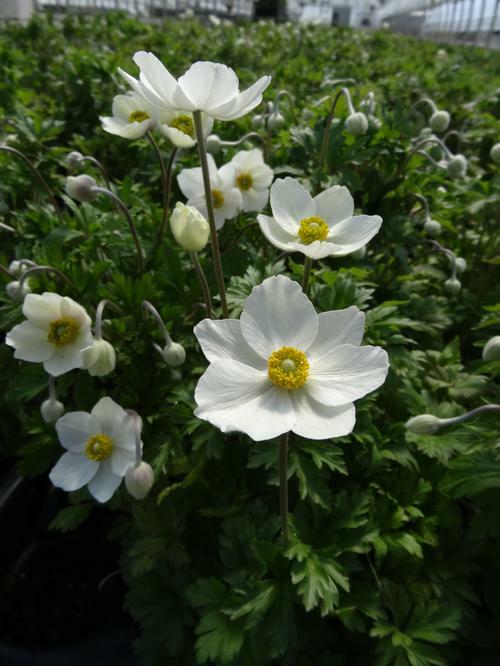 Forms large clusters of white flowers with greenish tips, floriferous with long-lasting flowers, vigorous grower. 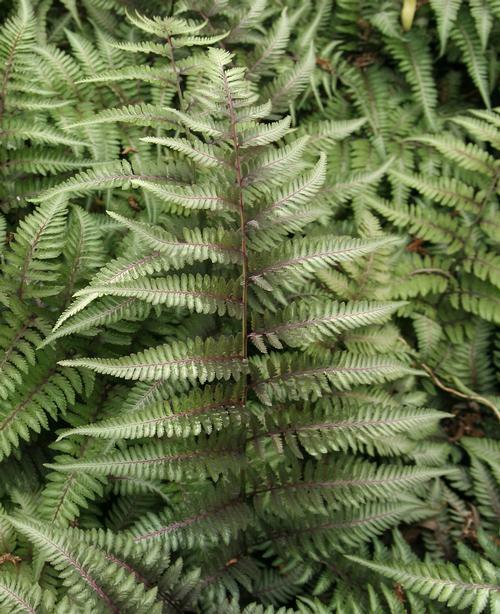 Very unique form of Lady Fern with long narrow fronds and alternating half scalloped leaflets along the center stem, a bit more compact with a graceful arching habit. 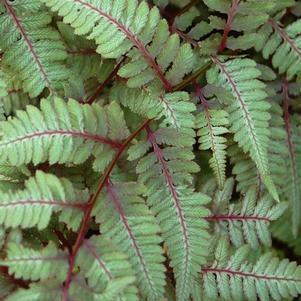 Green fronds are shaded with silver and highlighted with burgundy red, colors become more intense with some morning or afternoon sun.